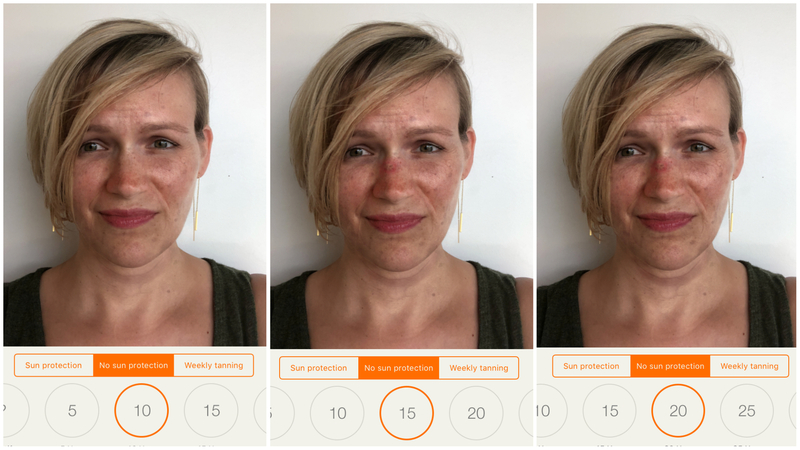 Sunface is a free facial aging app that lets you take a selfie and see what your skin will look like in the future based on your level of UV exposure. I get it, putting on sunscreen can feel like a chore. Despite the possibility of developing skin cancer from UV exposure, some people just can’t be bothered to use it on a daily basis, or even re-apply at the beach. But sun exposure doesn’t just increase cancer risk, it also leads to premature skin aging—we’re talking things like wrinkles, spots, and spider veins showing up earlier than they would have just as a result of you getting older. Past research has shown that people who get UV photographs taken of their face and see the sun damage already done increased their sun protection at 5 and 12 months after seeing the photos compared to people who didn’t have photos taken. 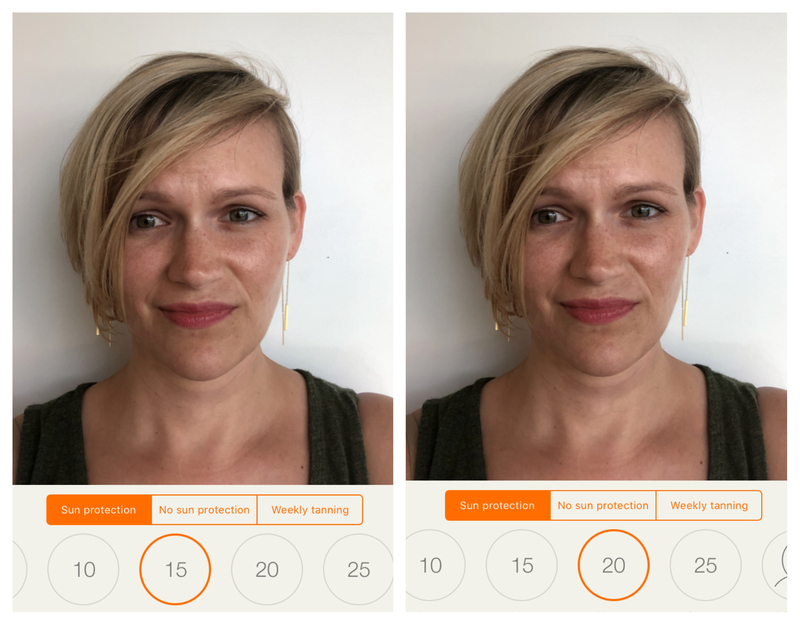 But a group of German researchers thought that an easy-to-use app that showed people’s future appearance could be effective, and they thought they could set something up that people could use in the waiting room of a health clinic, rather than requiring a provider to take a photo. For a research letter published Wednesday in JAMA Dermatology, they set up an iPad with a facial aging app—it approximates future appearance based on UV exposure—in a health clinic for one week and encouraged patients to use it. A total of 119 people used the app and filled out a questionnaire after. The photo on the left is the app’s start screen and the photo on the right is what the iPad kiosk looked like. They found that among the people who used the app, 88 percent said it motivated them to increase their sun protection and a similar percentage said it made them want to avoid tanning beds. The researchers didn’t actually track people’s habits over time to see if the app changed their behavior, but said that's an area of future research. When I mentioned this study in Slack, my boss asked a key question, “is the app available for download?” Why yes, yes it is. 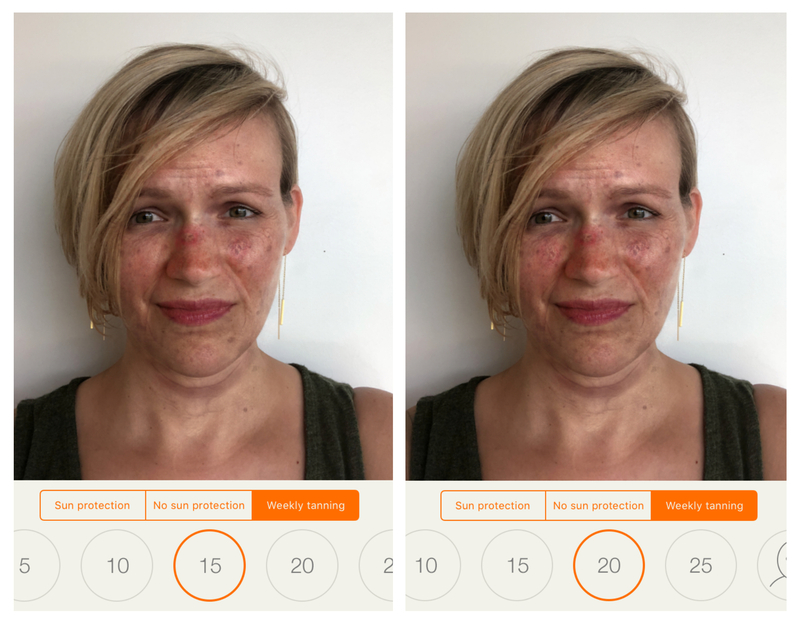 It’s called Sunface and it’s a free iOS app developed by one of the paper’s authors, Titus Brinker, who's a dermatologist at the University Hospital of Essen and a researcher at the National Center for Tumor Diseases at the German Cancer Research Center. The app’s description says “How do the sun or sunbeds damage your skin? See your future self without UV protection!” I put my face through the gauntlet for the sake of journalism. This is a selfie I took yesterday as a baseline. I use sunscreen daily and I'm already pretty freckle-y. Here’s what I’d look like if I used a tanning bed weekly after 15 and 20 years. (I forgot to take the 10-year photo SO SUE ME). I already use SPF moisturizer on my face every morning, but after seeing these photos, I started putting on even more and actually began applying it to my neck and chest, spots I usually ignore even though I know I shouldn't. And another study out this week suggests that people overestimate how much sunscreen protection they’re getting because they don't put on the recommended amount. The American Academy of Dermatology recommends using one ounce, or enough to fill a shot glass, over your entire body. If you're using spray, thoroughly cover all exposed skin and rub it in. So buy at least SPF 30, and put on a lot, and, yes, re-apply.